Traditional bach, comfortable and homely; close to everything but far from the world with superb views over the beach & ocean. The property has three bedrooms each with queen bed, a well equipped kitchen, wood burner, covered veranda & private outdoor shower. It’s an easy ten minute walk to the beach; surf, fish, walk, talk, read a book & in the evenings gaze in wonder at the heavens above. Pedestrian access via bridge over Oruawharo stream. Vehicle access requires crossing beach & shallow stream at low / mid tide. Please bring your own beach towels as these are not provided. The bach has solar generated electricity. Charging devices is no problem but not possible to operate heavy load electrical items; ie hair driers, coffee machines etc. I love good coffee, sushi, reading page turner thrillers, skiing steep deep powder, sailing fair winds & the sound of an air cooled 911. I’ve travelled widely and enjoy meeting new people from all walks of life and cultures. The island is completely off the grid and the bach is on solar electricty. Fishing, surfing, hot spring, read a book or do nothing. At night, gaze in wonder at the heavens above. Great Barrier is the only Dark Sky island sanctuary in the world! The View and set up are amazing! The View and set up are amazing!!! Great place if you're after a bach (not a flash holiday house). 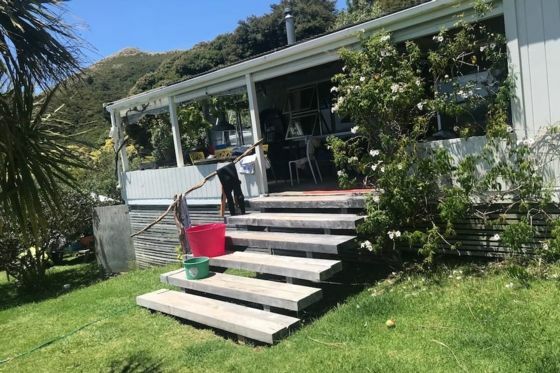 Great place if you're after a bach (not a flash holiday house).8 Min walk to beach, beautiful views from deck, three bedrooms (one is a new sleep out). The bach exceeded our expectations.